Back in January, I’d never run a 5k and I’d never done a parkrun. I chose to do both for the first time whilst on holiday in Melbourne, Australia. I mean, you have to start your professional running career in style, no? 6 months later, I found myself with the chance to embark on another international landmark: parkrun number 10, à Paris! I’d discovered there were two parkruns in Paris: one in Bois de Boulogne, which is located beside my friends at Roland-Garros in the west of Paris, and one in the picturesque Parc Montsouris, in the south of the city. I half-heartedly asked around about which park route was flatter but in the end, I settled purely on someone saying Montsouris was ‘one of their favourite parks in Paris’. I mean, if it’s beautiful, then I can deal with any hills there might be, right? So Montsouris is deceivingly all about the hills. The parkrun route is three laps of the perimeter of the park, 50% of which is running up a hill. Oh lovely, just what I like on a 25-degree heat morning! I’m not going to lie, I definitely stopped on this route. Who wants to run uphill? However, just as 50% was uphill, there was a glorious 50%-per-lap of downhill running. And I am aaaaall about downhill running. No effort whatsoever! This wasn’t my fastest time – 32:07 – but not bad considering the heat, the hills, and me being full of the cold! This was the smallest parkrun route I’d been to yet, with only 28 runners participating, a reflection, perhaps, of how new parkrun is to France: the first route was only set up in 2015. The majority of people there seemed to be ex-pats of sorts, either on holiday like me, or inhabitants in the city, who knew about parkrun from their home country initially and had then sought it out whilst abroad. There were loads of people running in the park though so it’s not a lack of fitness that’s preventing the locals from getting involved. Maybe it just takes a while for the word to get out? I do wonder though if the language plays a role in any way. Parkrun is not a difficult string-of-words, but it is still English. Parc courir, anyone? Regardless of the numbers, it’s very cool to travel to other countries and see the concept of parkrun working in exactly the same format as it does in your local park down the road. Admittedly, it is a pretty simple concept so it’s easy to see why it’s replicated so well across the globe. My next and final international parkrun of the year is hopefully going to be in Washington DC. No, you’re right, there isn’t a grand slam there! Unfortunately, there isn’t a parkrun in New York, would you believe, so sister Mac and I are going purposely out of our way to live the international parkrun dream. Come on NYC, get involved! The last time I wrote a blog post, Andy had made it as far as the 4th round of Roland-Garros which, given his past run of form, was already pretty good in my eyes. ‘If only he can get to a round that has the word ‘final’ in it’, I thought, ‘that will give him a boost of confidence and shoosh the haters’. I was also trying to not get ahead of myself, and think that I’d get to see him when I ventured across to Paris for the semis. I didn’t want to be disappointed again. Clearly, Andy was out for more than a wee ‘boost’. After winning his 4th round in straight sets against Russian Khachanov, he battled his way through a quarter-final against Kei Nishikori, a match I feared because of their previous encounter at the quarter-finals of the 2016 US Open, where Kei had knocked Andy out in an epic 5-setter. It wasn’t to be for Kei this time round though; the Murray-MacArthur forces were against him. Andy had got the memo; it was time for him to hang out with CatMac at a grand slam! I mean, I hope I get to see him closer than this at some point in my life but for a semi-final at one of the four biggest tennis tournaments of the year, I can’t complain! Andy came into the semi-final in almost miraculous fashion. His tennis hadn’t been that great, but he’d somehow found a way to frustrate and overcome his opponents. However, in the semi-final, he was up against seed number 3, Stan the Man from Switzerland, who had seemingly strolled into the semis on his favourite surface. I feared the worst. I was even more distressed when, at security, I had my Scottish flag taken off me. ‘But how is Andy going to know I’m there?’, I voiced to Viv, wishing I hadn’t worn it in patriotic fashion on the metro across Paris. Top tip for Roland Garros: hide your flags/take small flags/dress as a flag. I’m convinced my lack of flag affected the outcome. Back to the match, Andy defied all odds and played some of his best tennis of 2017. He won the first and third sets and at one point, Viv whispered, ‘He might actually do this’, echoing the thoughts I was too scared to voice out loud. But again, Andy got the memo. He knew I didn’t have final tickets so rather than me being disappointed at missing an Andy-final, he decided to play really well in the semis and then take a bow out of the tournament. Ha, or not. Given the tennis that was played over the whole tournament, Stan earned the win, but Andy deserves so much credit for his persistence and determination. How on earth does a player have such a bad warm-up clay season, yet still get to the semi-final, and almost the final of a grand slam? That’s the number one player in the world, for you! (6) And of course there’s always my favourite Google search: Andy Murray. No jokes, my phone has decided, without prompt, to make this a favourite on my Safari homepage. It’s important to find out what the world is saying about my favourite player. Shingles? Oh no. Elbow injury? How unfortunate. 30? It’s fair to say it’s not been the best season for Andy so far but it’s made me so happy to watch him fight through the opening rounds of Roland-Garros, and even more delighted that this viewing hasn’t been through refreshing an online newsfeed, as I had anticipated, but through live coverage, courtesy of ITV4. Who actually knew? Has this always been the case? Have I been depriving myself of the pinnacle of the clay season year after year? Thank goodness I discovered in time this year! In all seriousness, it’s like Christmas came early. Every day this week, I’ve been in work early, to leave early, to get home as soon as possible and dive my face in front of my laptop screen. I want to watch as much of this tournament as I can. I’d originally considered visiting Paris twice during this tournament, to experience both the early rounds and the finals, and to ensure I actually saw Andy play (remember that time I went to Australia?…). However, work constraints meant this wasn’t possible, and with an American adventure still to finance, it was probably for the best. Instead, I focused my efforts on getting finals tickets and when tickets went on sale on 22 March, I successfully managed to get myself 7000th-odd in the RG online queue for tickets. Unfortunately, the final was sold out by the time the 7000 people in front of me had finished their online shopping, so instead I opted to get tickets for the two men’s semi-finals. Two matches for the price of one? Sounds like a good deal to me. 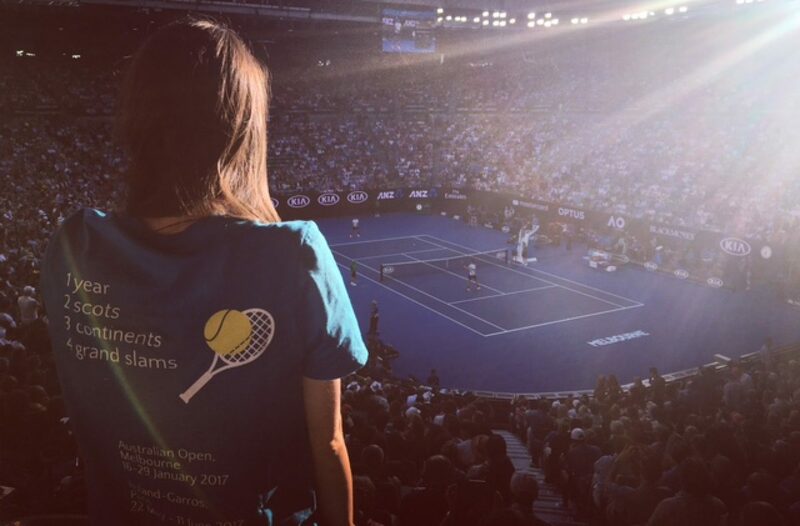 Read more about my experiences of getting tickets for the grand slams here. Viv, a friend from Japan, is joining me for the Parisian adventure which will see us hit up Roland-Garros in the flesh on Friday, go for a cheeky Parkrun on the Saturday morning and then hopefully, if I haven’t made up that this exists, watch the final on a big screen by the Eiffel Tower on Sunday. Only two rounds stand between me and an Andy Murray semi final – fingers crossed he gets the memo this time round!